I visited ARoS—the art museum in Aarhus—before beginning my ride down the eastern coastline. The size of ARoS is impressive considering that Aarhus is a relatively small city of just over 250,000 people. Earlier this year a new “piece” was added to the museum’s permanent collection called the Rainbow Panorama. 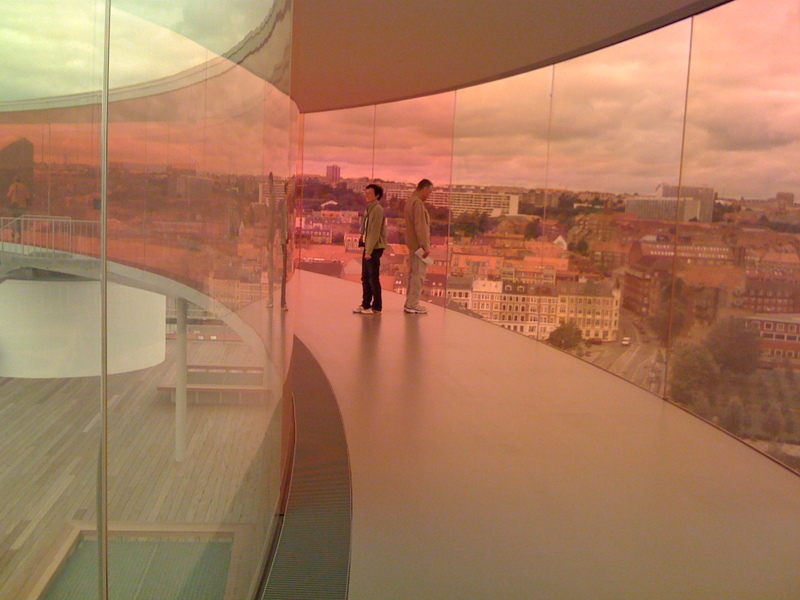 It’s a multimillion dollar circular walkway at the top of the museum allowing you to view all of Aarhus in the colors of the rainbow. The different floors of the museum were designed to symbolize Dante’s travels from hell to purgatory to heaven with the Rainbow Panorama representing heaven. I circled the Rainbow Panorama a few times taking in my final views of Aarhus in different color schemes before heading back into the real world to navigate the windy roads of southern Denmark. The orange part of the walkway was my favorite. My ride Tuesday was pleasant and short (about 50 kilometers). The weather was good—and I’ve been carrying around a tent and a sleeping bag—so I planned to camp that night. I’d never camped alone and I wasn’t sure how I would feel about it. 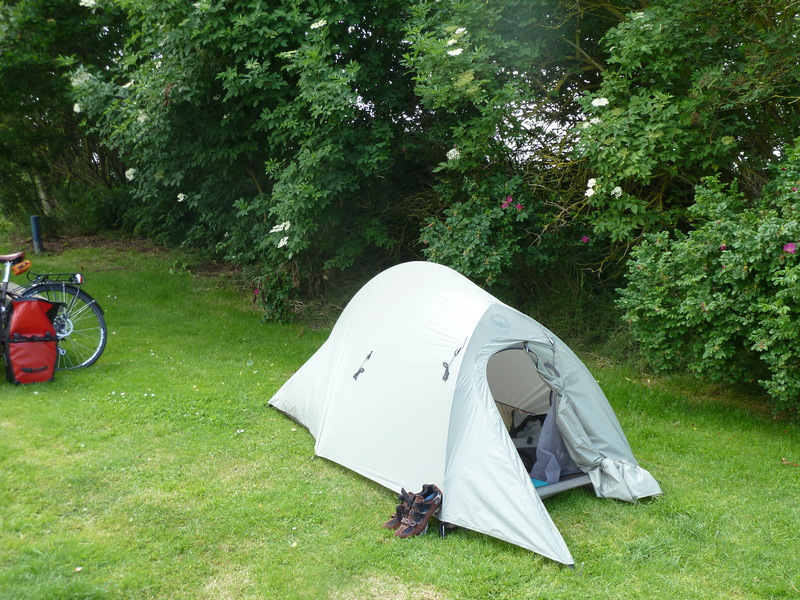 There was a beachside campsite that I had scoped out before leaving Aarhus and when I arrived at the site I met a friendly couple also doing a cycle tour. Their warm presence alleviated my nervousness; I set-up my tent at the campsite and slept well. 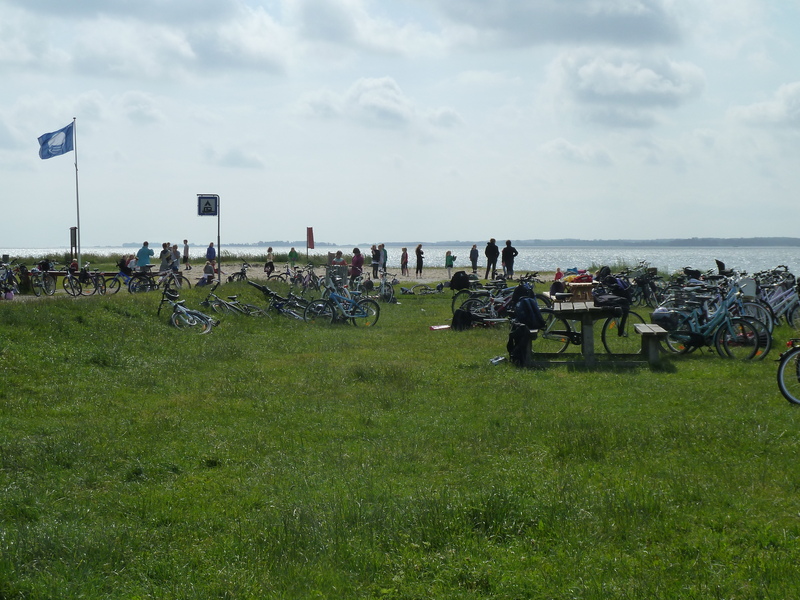 Before beginning my 65 kilometer ride to the town of Kolding I enjoyed a sunny morning on the beach reading while a school group on their end-of-year field trip played. You’ll notice they all biked to the beach together. Parts of southern Denmark somewhat remind me of suburban America. The houses along the fjords are big and situated on wide lots with lawns and driveways leading to full garages. These wealthy waterfront towns still have wonderful bike lanes on most of the main roads that are clearly separated from the car and pedestrian lanes, however, there aren’t many cyclists on the roads and cars have a dominant presence on the road. My hosts in Kolding—Helle and Niels Bjerresgaard—are close friends of my co-worker back in Seattle. Their house reminds me of my parent’s house; the paintings, wood carvings, weavings, and photographs tell a story about the many places they have backpacked to with their four kids. 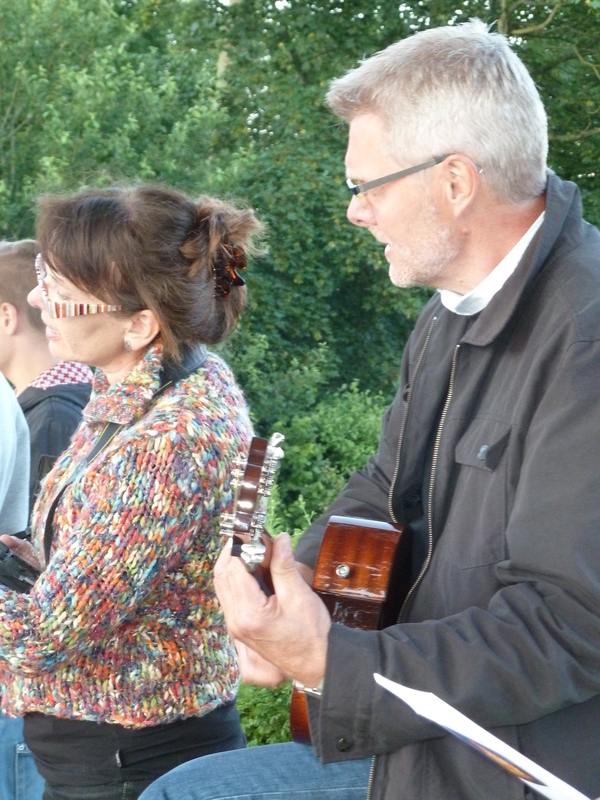 Helle and Niels singing at the summer solstice party we went to last night. Helle and Neils were interested in my project and shared with me that while raising their children in Kolding over the last 30 years they have seen fewer and fewer children cycling. Denmark has one of the strongest economies in the EU and with wealth comes increased consumption. They said that in this part of Denmark it is not uncommon now for families to own two or sometimes three cars. The towns along the coast are fairly spread out and often people live and work in different towns. 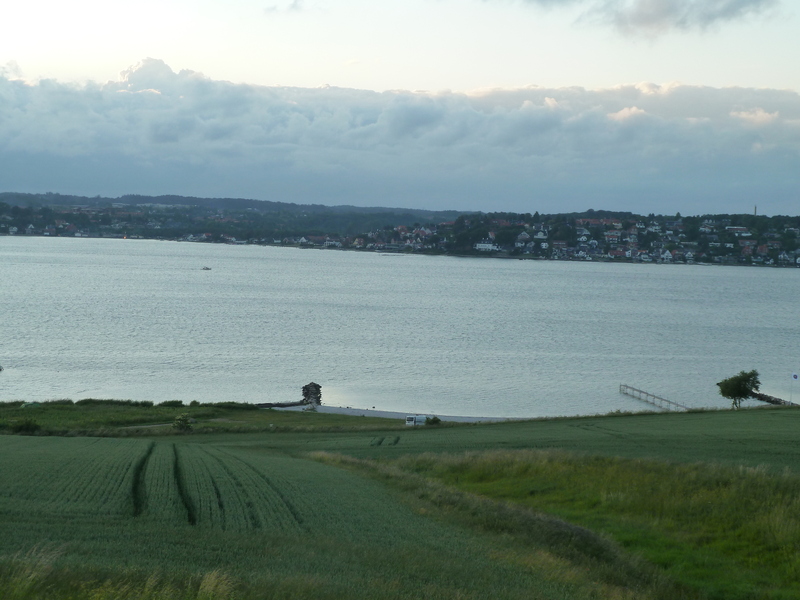 A view of the town of Kolding from the other side of the fjord. Car ownership has resulted in a departure from the traditional cycling culture even for children with short commutes to their local schools. Helle said that by the time their youngest son, Troles, was in school she was amazed to see traffic jams in front of the school each morning because so many children were being dropped off by parents. Fewer children biking and walking to school changed the way Helle felt about having her son go to school on foot or by bike. Even though she never drove her three older kids, she said she began to wonder if it was safe for Troles. Should she start driving him to school? Also, because of all the drop-offs in the morning the amount of car traffic near the school had increased dramatically creating a more dangerous environment for the children who were not driven. Helle didn’t start driving her son to school and was proud to report that all four kids were only driven to school a handful of times over the years. However, Helle doesn’t represent the trend. Over the last 15 years the number of children who cycle to school in Denmark has dropped by 30 percent.1 Not all municipalities in Denmark had the same vision that leaders in Copenhagen did about cycling, but some cities are trying to rekindle the culture of cycling in their communities and especially among youth because of the numerous benefits of biking. Biking—or any other form of regular physical activity—helps prevent a slew of lifestyle-related diseases. Thirty minutes of moderate exercise a day can prolong your life by up to five years according to Copenhagen’s Department of Public Health.2 The University of Southern Denmark did a study of almost 400 school children in a town neighboring Kolding and found that children who walked or biked to school were significantly more active than children who were driven to school.3 The kids wore accelerometers that tracked their physical activity throughout the day. The kids who biked or walked to school didn’t just get more activity from their commute alone; the study results showed that they were more active at other points throughout the day. The study didn’t look into why mode of travel impacted activity levels at other times but the researchers hypothesized that activity early in the day could prompt higher levels of movement during play time later in the day. I know from personal experience that the more active I am, the fitter I become, and the more I enjoy and seek out physical activity. The times I have been inactive have resulted in loss of fitness and I’ve become disinterested in activities I used to enjoy. Denmark is one of the safest countries in the world to cycle and yet parents are beginning to drive their children to school in part because they see other parents doing it. Helle didn’t question her decision to have her son bike or walk to school until she noticed the declining number of other kids out on the bike and pedestrian lanes in the morning. Humans are very aware of the decisions other humans make. We get cues from each other about what is perceived as safe for ourselves and for our children. I felt safe at campsite simply because I saw two other people there who reminded me of myself. I really didn’t know anything about these people, but their presence alone transformed the campsite from a potentially dangerous place to a safe place. The schools in Kolding and the neighboring towns are working to get more kids back on bikes through different initiatives. One town offers a biking school in the late summer to help kids and parents map out a safe route to school that the kids will follow throughout the school year. The schools are also trying to incorporate biking into more school sponsored activities—like the beach field trip. Although the actual risk factors associated with biking in these quaint Danish towns are very low—and the benefits of biking are numerous—the most powerful behavior change tool for parents who drive their kids to school will be the sight of more and more other kids out biking to school together. The presence of other people—whether we are on a street or at a campsite—reassures us that we are in a safe place. When we are alone, we begin to question our safety and wonder if others have more information than us about risk factors we exposing ourselves or our children to. 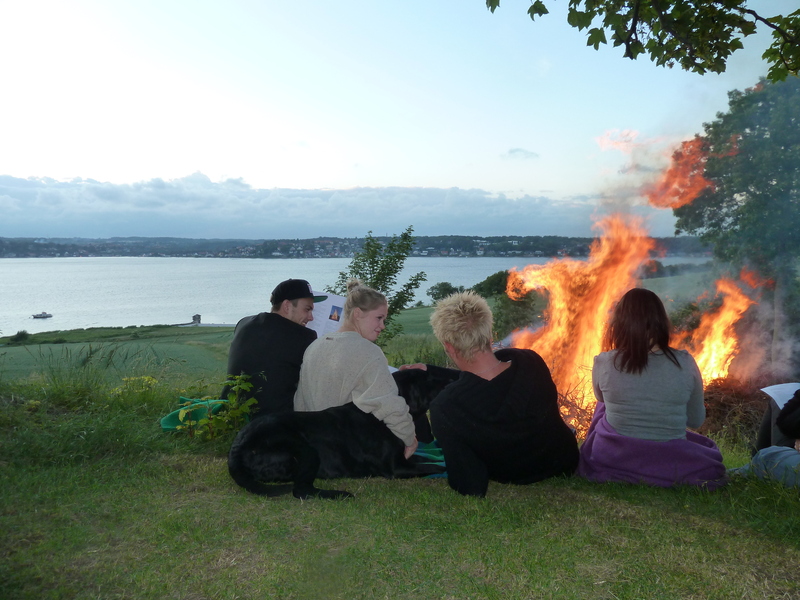 The summer solstice bonfire in Kolding reminded me of summer nights on Mercer Island. Troles, age 18, is the furthest to the left. Finally found my way to your blog thanks to your mom’s email. Regret it has taken me so long to get here. I thoroughly enjoyed your writings and will now check in often. The pictures are really fun too. Fred is dozing in front of the TV (hard to believe – I know! ), Trevor is drinking beer at a friend’s house and Darby & Whit are spending the evening together. Darby had to take one of the station’s cars to Issaquah to repair a broken window – so I drove out and kept her company while she waited. You definitely have all of us beat in the exciting, non-boring lifestyle. Fred & I have never felt more bored and dull in our basically wonderful lives. Thanks for the nice note! I think about all you Reeds often and look forward to filling my middle child role again upon my return. Hi CMG – I read this article in the NY Times this morning and thought I’d pass it along. It could be useful source material! So exciting to read about your adventures on your blog. Love from your friends in Kolding. So wonderful to hear from you. I think of you, Niels and the kids often. It was such a treat to spend time with your family! All is well with me. Enjoy Italy!